When a friend asks you a favor, you can’t really say no, can you? Obviously within reason, I’m always happy to lend a hand. But here’s how Coco and I initially thought about it, when Sebastian had asked us to take part in a little TV documentary he was about to do: Nada. Nooooo! I mean, NO WAY! On the other hand Sebastian is a very dear and helpful friend who showed persistence and then, what bad could really happen? As soon as we got a handle on the kitchen mess, my kitchen spirit asked for a non-elaborate, quick summer cake – we enjoyed the warmest April in the last 100 years (and finally got some long-awaited rain this morning). Rhubarb is currently on everyone’s mind, so I quickly settled for an easy to make crumble cake, however, one with an extra dose of calories: including a heavy cream and egg frosting. Pouring it over the half-baked cake gives it extra creaminess and rewards the baker with a juicy fruit cake, one that eventually will be dense enough to be eaten right out of your hand. Preheat the oven to 180°C (~355°F). Thoroughly butter the cake form (~26cm in diameter) or use parchment paper to cover the bottom. Now put one half, up to two thirds of the crumbs in the baking form and gently press down to form the bottom as well as a rim. Depending on what fruits you’d like to use for your cake and how juicy they are, cover the bottom with a thin layer of breadcrumbs to prevent the fruits from completely soaking the cake bottom, then evenly spread the prepared fruits. Finally cover them loosely with the remaining crumbs. Bake for about 25 minutes at medium level. Meanwhile prepare the cream frosting: Combine eggs, sugar, scraped out vanilla seeds and heavy cream in a mixing bowl and beat well. After half the baking time (the 25 minutes mentioned above), remove the cake and slowly pour the frosting over it, let it soak deep into the cake. Make sure to spread it evenly and try to not let it get beyond the rim (it may leave dark, burned spots, but doesn’t really influence the later taste). Bake for another 25 minutes or until the top turns golden brown and the frosting has set. Remove from the oven and let rest for 10 minutes before releasing from the baking form to further cool down. Serve with some whipped cream if desired and enjoy. Required time: prep. 20 min., baking ~50 min. mmhh! we seem to have been on the same wavelength - again - as i made rhubarb crumble icecream. being a rhubarb addict, though, i am sure going to try your cake too! Thanks for THIS (and that), Nicky, you and the other two ladies have earned a big long lunch at least. What happened before and after your show you can see here. Now it’s your turn, Coco. Uh, sorry, I forgot: rhubarb and crumbles and breadcrumbs and cream frosting all together on a cake like this, life couldn’t be better. Even on TV. That's fascinating. 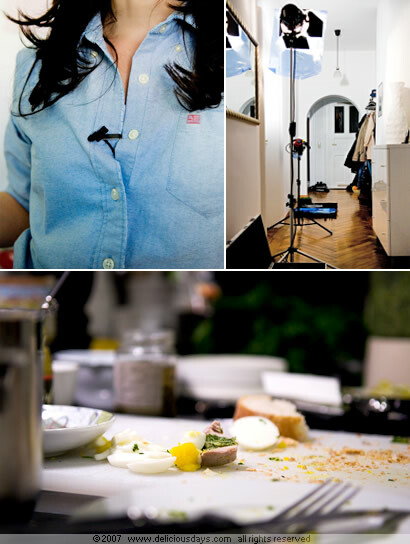 What dish were you trying to make for the TV show? I've kept my eyes peeled for rhubarb here in Toronto, but have not yet seen any in the markets. I'm so eager to finally have those incredibly vibrant spring colours back in my kitchen. Da hast du jetzt also auch Fernseh-Koch-Erfahrung ;-) Ich fand es sehr interessant, hinter die Kulissen schauen zu dürfen, auch wenn ich es wohl nicht noch einmal machen würde. Man sieht Kochsendungen nun tatsächlich mit anderen Augen. Erstaunlich fand ich, wieviel Aufwand (Drehzeit, Bearbeitung, Leute...) selbst ein kurzer Beitrag erfordert. Bin auf jeden Fall schon sehr gespannt! Wow! That sounds (and looks) absolutely amazing! I never thought about adding cream and egg to the topping like that... what a great idea! Thank you for your lovely photos, as usual. I didn't know rhubarb was in season. I thought it was more like a fall thing. I guess by fall it is too tough for cooking. Thank you! That cream frosting/icing is the exact same one my mom used to make to cover an apple cake. I am so giddy I stumbled on your post because I was looking for the recipe everywhere. Thanks! Well, TV was worth a try...thanks for the laugh. The cake looks delightful. I usually stick to a rhubarb crumble, but am going to have to try this...it would be a great alternative for dinner parties. Like Sara said, rhubarb recipes are popular right now. My mother likes to bring me fresh rhubarbs, grown in my aunt’s garden. The rhubarb season starts next week in Montreal, so your crumble cake is on my list. I can wait to taste it. Especially that they forecast warm whether at last. Since the outdoor parties starting soon, I hope it makes the cut of my new summer dessert recipes. I will keep you posted. All this hype inspired me to try to grow my own rhubarb. The fresher, the better after all. Rhubarb is easy to grow in a sunny spot. I just talked with my aunt; she will give me a few plants to start my little garden. I will get for about two months of fresh rhubarbs. I need to collect more rhubarb recipes. 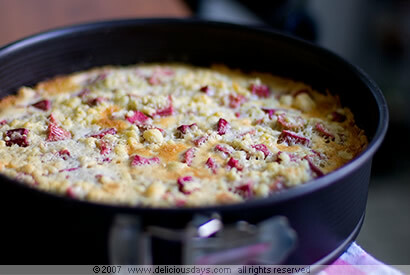 I can honestly say I have never had rhubarb cake but it looks quite delicious and worth trying in the near future. What a fun read! My sister once had a TV team in her house and said she would never do that again, they left a big mess. I second Rob's question, what did you cook for them? We've had the sunniest April in living memory here in Ireland too, but of course now as I type this I'm listening to the wind and watching the rain pouring down. No complaints though it gives me the perfect opportunity to try this recipe. Thanking you in advance! What a beautiful cake! It looks delicious, too! Just stumbled upon your gorgeous blog and am already hooked! I've been reading your archives for over an hour now and almost forgot an appointment, will be back for more!!!! This crumble cake looks really delicious... I want a slice !!!! oh, the final product looks stunning.I love rubharbs. Klingt ja spannend, und wann wird die Sendung über die Herstellung des Rhabarberkuchens im TV gezeigt? A rhubarb crumble cake is one cake I haven't tried yet (I've cooked A LOT with rhubarb during the last week or two) - I love the pink colours!! Rhubarb crumble cake looks so delicious! Rob, It was poached tenderloin (pork) with a green bread sauce, a recipe I will definitely make again. Especially the method to prepare the meat is great, less work & convincing results! Petra - Hallo Leidensgenossin ;) Du sprichst mir aus der Seele. Wär's nicht für Sebastian gewesen, ich hätt's ganz bestimmt nicht gemacht... Ein Erfahrung war's auf jeden Fall, ich hab vor allem die Geduld des Teams bewundert. Wir haben z.B. auch bei meinem Bäcker und Metzger gedreht, da hat es immer wieder eine Ewigkeit gedauert, bis man weiterdrehen konnte, entweder hat ein kleiner Junge ewig bei der Auswahl seiner Naschereien gebraucht oder ein Mann kauft nicht nur eine Leberkäs-Semmel, sondern ratscht auch noch 5 Minuten mit dem Metzger... während das ganze Team neben ihm steht und Däumchen dreht. Kim, My grandma had huge rhubarb plants in her garden, but that was long, long ago. I'll keep my fingers crossed for your own garden and am a bit envious, I'd love to have my own garden, too! Laura, We finally got some rain too, mother nature is happy... and if nasty weather gives a good excuse to cook and bake - so it'll be! I still remember your rhubarb post from last year...I just LOVE rhubarb, in any form! Very good recipe. I've made the cake and it was delicious. It reminded me in principle of another Bavarian cake, the "Zwetschgendatschi" which my mom (from Munich) always makes. Actually I think it is exactly the same dough. Thank you for the recipe! It's delicious. I am eating it as I type. I made mine with fresh cherries and it was very good! The dough is easy to prepare and so nice to work with, thank you for sharing. wanted to try the recipe yesterday thinking I had frozen rhubarb. But when the dough was in the silicone baking mould from Aldi I had just bought, I noticed : no rhubarb. Desperate, I tossed frozen sour cherries into the cake, and now guess: It is out of this world! Thank you for all your delicious ideas. 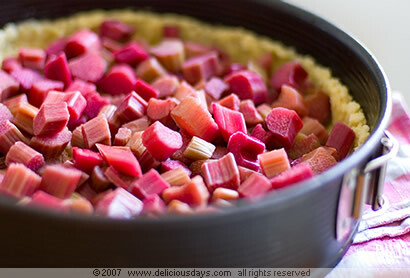 There is rhubarb all over the northern hemisphere food blogs this week, It must be the season. Nicky this looks devine. 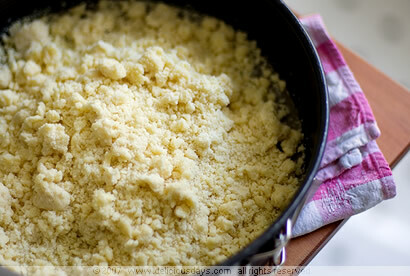 This is like a crumble but with a crumble base as well. New to me so I must try it. Super einfach zu machen und schmeckt SENSATIONELL !